I was so proud of the males in my family tonight. For dessert I made pudding using silken tofu and they all ate their whole servings. I even sweetened it with sorghum and my oldest thought it was delicious. This just goes along my whole opinion that kids will eat a variety of food if you give it to them and don't make a fuss. I still serve sugar, I just limit the amount of granulated sugar and try to use honey, sorghum and maple syrup when possible. My kids have slowly adjusted, so much so that my oldest has been nagging me to allow him to take a packed lunch to school since he loves my food so much. I love that my kids will eat just about anything without complaints, especially if it contains chicken or pork. One of my family's favorite meals is pot roast. There is something so comforting about starting a pot roast on a Sunday and sitting down in the evening for a delicious meal. This week I tried a new recipe for Classic Pot Roast from the February 2013 issue of Parents magazine. This recipe has 13 ingredients. It takes a total time of 3 hours, 30 minutes of which is active and makes 8 servings. I had no problems finding any of the ingredients at my local grocery store. Since I eat gluten free I used cornstarch instead of all-purpose flour to thicken the pan juices. If you aren't a fan of carrots skins than I would suggest peeling them before chopping. The recipe doesn't state this, but I always do it since my youngest isn't a fan of carrot skin. Make sure to let the roast rest. This rest time is very important for letting the juices stay in the roast. If you cut the roast before letting it rest the juices will spill out making for a drier roast. I followed the remainder of the recipe as written. My husband really loved this roast. He thought it was one of the best pot roast recipes that I have made in a long time. My oldest was also a big fan, he ate most of the leftovers. The roast was a little on the dry side without the pan juices. I would add additional beef stock to the pan while the roast is cooking to ensure a larger amount of pan juice to serve with the roast. This recipe is currently not available online, but can be found in the February 2013 issue of Parents magazine. 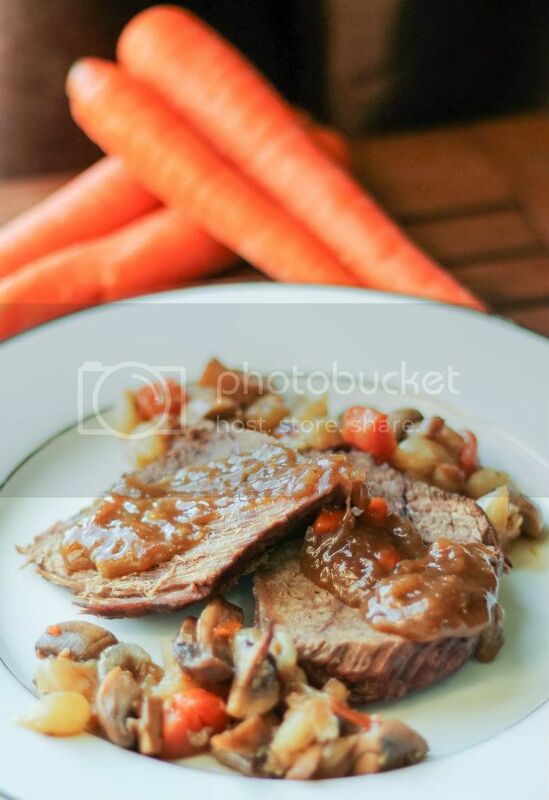 Here is another recipe for pot roast from Parents magazine. I grew up on pot roast, but my kids don't like it as much as I did/do, so I don't make it all that much. I just made one last week, but in the crockpot. This recipe looks so good though! I do my pot roasts in the crockpot a lot also, they always turn out great! Its so cold out today, I wish I would have thought of making this. You take great photos! Thanks :) It was easy to put together also!